1. Fixed layer visibility in sidekick. 2. Added Component Axis Contraint in the Status Bar. Fixed Custom Constraint and UI updating for Contraints in the status bar. 3. Added Store and Recall Local Pivot in the Pivot Menu. 2. Added Clean Verts with only 2 Edges in the Tools menu. This will delete verts that only 2 edges visible. 3. Added Bounding Mesh icons in the Mesh Create Rollout. 4. Added Prism, Gear, Soccer Ball, SuperShape, and Text primitives to the Mesh Create. 5. Added Store and Recall Local Pivot in the Adjust Pivot Rollout. 1. Fixed the Combine Bake. 2. Removed the PBR library and merged it into one tool with the Create Material from Texture. 3. Fixed the suffix naming for the texture slots and also made them Non Case Sensitive. 4. Added straighten Curve Horizontal and Vertical in the Straigten section. 5. Added average Horizontal and Vertical in the Straigten section. 6. Fixed Units in the pixel ratio when loading Ninja UV. It will now set the units to the scenes unit scale. 1. Added Boolean Difference + Intersection. 2. Added Boolean Difference + Keep Last. 4. Added Axis Direction to Deform Along Curve. 5. Added Deform Along Selected Edge. 1. Added option to show UV/persp panel inside the Ninja UV. 2. Added option to show persp panel inside the Ninja UV editor window. 3. Added map tab inside Ninja UV editor window. 4. Added Align UV Left, Align UV Right, Align UV Top, and Align UV Bottom with edge selection. 5. Added [Apply Material From Last Selected Face] in the material Tab. 6. Added PBR Material Library. 8. Fixed Uv linking when switching uv sets. 9. Added Tiling info in Check Ratio. 10. 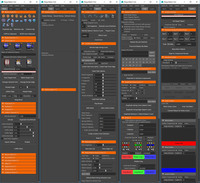 Added UV Toolbar in the Ninja UV Editor Window. 1. Added Rotation Controller to control Rotation of Pipes. 2. [Clean Slected Pipes] will remove all connections correctly. 3. Added Angle to LJoint so you can create LJoints at any angle. 5. Added [Delete Selected Pipes]. 7. Seperated Cap Segments from Pipe Segments. 10.Adjusted UV's to fit on a texture page. 2. Updated UI for 2017. Added Side Kick Mode (Workspace 2017) in the Ninja UI menu. This will create the UI in a dockable Workspace tab for 2017. 1. Added Select Contiguous. This will select contiguous faces within a certain Angle. 2. Added Grid Divide. Divide a mesh based off a grid in x y z axis. 3. Fixed Weld verts to work on multiple objects. 4. Fixed Delete Alternate Edge Loop to work on multiple objects. 6. Updated Select by name. 2. Added Move UV in either UV space or Pixel Space. 5. Added Create/Assign Material from Texture. Select texture for the color channel. if normal map and spec map have suffixes it will automatically add those to the corret slots. 3. Fixed pathing for Ninja Forge. 2. Added rotation increment buttons for 5, 15, 30, 45 degrees. 1. UI Icons: Updated Icons. Uninstall icons then re-install icons. 3. Adjusted UI Buttons to be larger. 4. Updated Color Settings for buttons and rollouts. 5. Updated Angle Snap to have presets. Right Click the Angle Snap field to set Angle Snap presets. 6. Started Adding Clone funcionality to open duplicate rollouts. Any Rollout that says (*) will be able to Clone that Rollout to work independently. This will also fix issues with the Interactive Help. 7. Bonus Script Section now you can double click a script and it will open it up in a window. 8. Fixed all warnings with the -borderstyle in Maya 2016. 1. Ninja Export 1.0. Ninja Export is a batch exporting script. This is replacing Ninja_UDK. Please remove Ninja_UDK from the /Ninja_Dojo/Bonus/ directory. 2. 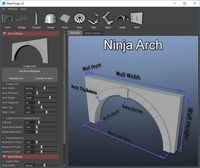 Ninja Convert 1.0 Ninja Convert is a simple distance conversion tool that converts kilometer, meter, centimeter, millimeter, mile, yard, foot and inches. 3. Ninja Paint Prep 1.0. Ninja Paint Prep is a tool to help paint textures onto a mesh. This is uesful if you are using RGB Blend Maps for your shaders. 1. fixed saving of Shelf of "None". 2. Updated the Combine to help clean up empty nodes associated with meshes. 1. Updated the Attach to help clean up empty nodes associated with meshes. 2. Fixed some issues with deform along curve. 3. Fixed some issues with duplicate along curve. 5. Updated Coffer: added Keep Faces Together, Taper and End Scale. 6. Added Cloning ability to Most Rollouts. 7. Added New Re-Cap Faces. This Will rebuild Faces with a specified number of Divisions. 3. added move and sew option to detach uv shell. selected edges will get sewed after detaching uv shells. 5. added a select rollout. 6. added scale move sew. 8. Added Cloning ability to Most Rollouts. 2. Added Delete UV and Copy UV in the custom uv window. 1. optimized speed when collecting uv shells. This will affect shells with a large number of UVs. 1. Added constraints to the Ninja Dojo Toolbar on the main UI. This is now context sensitive. 1. updated translate, rotate, scale constraints so it is now context sensitive. 2. (New) Added Ninja Divide. This will divide edges on a mesh to a certain length. Auto Divide Edges will divide your whole mesh. You can also divide single edge rings with Divide Edge Ring. 1. Inproved the Copy And Paste UV. You can now copy and paste from object to object. 2. Added Scale Tools to the Ninja UV Panel inside the UV editor. 3. Added Copy and Paste Tools to the Ninja UV Panel inside the UV editor. 3. Improved Layout Horizontal and Vertical. 6. Pixel Ratio is now based on scene scale and not limited to Meters. You can now change the Distance Value. So you can map 512 per 2 meters if you like. 1. Changed Outliner Tab to say OL. This will fix a small UI issue on Mac OSX. 2. There is now a quick display toggle for shelf time range command and help. 1. Fixed an issue wish select by same name with groups. 1. Fixed an issue when you ran Check Ratio on an object with multiple uv shells. It will now only check one uv shell. 2. Fixed an issue with Scale To Last when the target object had multiple uv shells. It will now only scale to one uv shell size. 3. Set the default iterations to 100. 4. optimized the UV scaling function. 5. fixed a small issue with Uniform Mapping. You can now have just a edge selected on a mesh and dont have to have faces+edges selected. 6. Added Calculate UV usage. It is located in the Help menu of Ninja UV. It requires that all uv's are within the 0-1 area and no overlapping uv's. 9. Fixed Docking window when switching from Docked mode to other modes. The window will now automatically dock if you have 2011 or higher. 10. Added icons for Ninja Mapping, Uniform Mapping and Tube Mapping if you have Ninja Dojo and have installed Icons. 2. Fixed an issue wish select by same name with groups. 2. Adjusted UI. Moved the Ninja Tools Buttons so they will always be visible. 1. Improved speed of Align Object to Topology when align normal is set. 1. Added Hide Target, Show Target, and Make Live buttons. 2. Added a Topo shader and Target shader. 3. Fixed an bug when you hid the target object and unhid it..it would lose the Live mode. 2. Fixed a minor bug in the Straigten UV where it might skip uv's that shared edges. 3. Added some standard UV mapping buttons. 7. Added Multi Bake Range Bake. 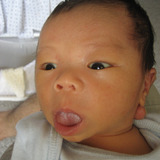 6. updated Attach. you can now attach hierarchys. You can attach parents to children. 7. updated Select Faces by angle. You can now set a normal direction and select faces with the angle tolerence within a selection of faces. 5. Added a straighten UV Selection. This is a much improved way of straightening UV's. It will work with uv shells that have holes. The angle tolerence will determine which edges will get straigtened. 1. The Fracture shader no longer gets created at startup. 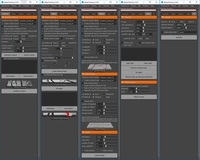 It will get created once you turn on "Assign Fracture Shader to Cuts" in the Adavanced Options. 1. Added a Type Filter list. You can filter out types by selecting the types in the list. 5. The Select by name field no longer auto updates. 5. Added Align Object to Componet. Select the object first then a component. This will align the object to the center of the component and align the rotation to the component normal if align normal is checked on. 6. Added Auto Create Tube checkbox. This will automatically create a tube while creating a Curve. 7. Added Clean Tube Splines. This will delete the spline after a tube has been created. You will no longer be able to edit the Tube settings if you have this checked on. 8. Select By Same Name will now select multiple object names instead of just one. These updates have not been itegrated into the Main Ninja Dojo UI. They will only be available for the Full Mode Version. 1. Added a Shader Library Section. You can now export shaders and it will render out an icon. You can import those shader and apply to selection. 3. Added a video Tab. You can render out icons for supported videos. 1. There are 2 straighten UV options. Straighten UV Shell And Straigten UV Edges. 2. Added Randomize Tile UV and Randomize UV. 3. Made some speed improvements to Finding UV shells. 3. Migrating The shelfs. Under Help click on Migrate Shelves (v5.0) you will only need to run this once. 1. Scatter: Removed the interactive Density Change. 2. Changed default Path to where Textures get baked. They now get baked in the ../maya/NinjaDojo/NinjaBake/ directory. 4. Added error checking to auto refresh icons. The auto refresh will crash 2013. 7. Changed the format that the preview is rendered to. This is due to compatibility issues with mac OS. 3. Bonus Scripts are now 3 columns instead of 2 an no longer have the Ninja_ prefix in the name. 4. fixed a bug with Exit Ninja Dojo that would cause the channel box to not open the next time restarting Ninja Dojo. 5. Layers: added Sel obj layer. You can select an object and click [Sel obj layer]. This will select the layer the object is in. 6. Layers: added Hide obj layer. You can select an object and click [Hide obj layer]. This will set the objects layer not Visible. 3. fixed an issue with straighten uvs. Fixed a bug that would remove uv's when an object had multiple uv shells and had shared edges. 4. fixed a bug with bake AO. 1. added store transforms and paste transforms. This will store translation, rotation, and scale of selected objects to a text file. You can then paste those into another maya scene. This is useful if you are working on multiple versions of file. 3. Mesh optimization: added Multi Edge Delete. 4. Mesh optimization: added Multi Edge Ring Collapse: Allows you to do a edge ring collapse on multiple objects. 5. Mesh optimization: added Multi Edge Loop Delete: Allows you to do a edge loop delete on multiple objects. 6. Search and Replace by name. the search and replace button will always update the search text to what ever is selected. 7. added Align Objects by Components. This will snap objects together by selected components. The Last component will be the target component. 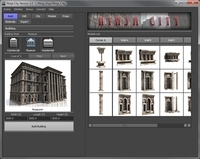 8. added double click on primitive creation. This will create a primitive at 0 0 0 with a size of 1. 1. added ability to import and place to component selection. 1. Updated UI : Added an Advanced Options rollout. To update the Icons.. you will need to run the Install Icons under the Help Menu then restart the Dojo. If you are using maya 2010 or below you will have to restart Maya. 2. Added collapse and expand for SideKick. This only works in 2011 and above. 3. Set Side Kick Mode to be default. You can use the [>] [<] to expand and collapse the side kick. 4. Streamlined The ninja buttons and reubuilt icons. 5. Added a bonus button. This will launch the bonus tools inside the Ninja Dojo instead of launching a new window for the tool. 6. Removed Add Outliner in the UI menu.. This is no longer nessary. 7. Remove Side Kick Right in the UI menu. This is no longer nessary. 8. Removed Dock Modes in the UI menu. This is no loger nessary. 9. Fixed a bug when running Ninja Dojo for the first time would not build all the UI. 10.Fixed a bug when creating the Ninja Dojo right after running the script the first time. 1. Updated Atlas bake. It now has an option to overlap uv's if object names are similar. It also has options to group and duplicate the objects. 6. Updated Straighten UV's to work better with objects with Multiple UV Shells. 7. Added a preview to the Texture Baking. 2. Fixed issues with Create Tube when using a line. 6. Added Follow Axis and Up axis to Duplicate Along Curve. 1. Fixed Select by same name if selected object did not have a number at the end. 1. Changed Ninja Mapping so you can use ninja mapping in any camera view. 3. Updated the Edge List so it doesnt store names but only the edge IDs. 4. Added Snap Point in the Snap UV Shells. you can use extents or center. 5. Added a calculate U size and V size in the Move UV section. 6. Added a interactive Symmetry Mapping. Just select the center UV and start the symmetry Mapping. When your done click on Stop Symmetry Mapping. 7. Fixed some issues with Cut Edge List. 3. Added Match Selected Verts and Match Border Edge. This works like merge vertex but across multiple objects. It will keep objects seperate. 1. added sidekick mode. You can have the sidekick on either the right or left side. Its under the UI menu. For this update you should remove previous versions and install a clean copy. Some scripts have moved to different directories. 5. Renamed Edit to Hist. Cleaned up Hist UI. More Icons have been added to the Ninja_Mesh. If you have already installed icons.. you will have to re-run the install icons. If you are using maya 2010 or below you will have to restart maya after installing the new icons. 10.Added ability to create New Sytles in the Build tab. 11.You can create a new project by right clicking a Style Icon in the Build Tab. 1. changed UI load to load all at startup instead of deleting and creating UI's. This results in faster switching between Tools. This will also keep setting when switching tools. 3. Added Install Icons under the help menu. And added Un-install Icons in the help menu. Under the Ninja Dojo Help Menu ---> Install Icons. Under the Ninja Dojo Help Menu ---> Un-Install Icons. 2. Added Color Scheme to buttons. There are now colors at the top of the Dojo UI. click these to change the button colors. The First color is the current and custom color. click this one to change to a custom color. The color will be saved to an ini file and will load on restart. 2. Added Adjust pivot to min X, min Y, min Z, max X, max Y, max Z. This will set the pivot of an object to the min and max extents. 3. Added the option to mirror either from the center or the Extents of an object. You can now mirror in all directions using the extents of the object as the mirror point. 6. Fixed a crash bug when you had the history list open with nothing selected and you used your mouse wheel to scroll in the Ninja Mesh UI. This crash would only happen with 2010 and below. 7. Fixed the refresh histoy when nothing was selected. It will now display "nothing selected" instead of keeping the last selected history. 1. fixed an issue with maya 2008 not showing files with icons. 2. fixed warning about bookmark file not existing. 1. Added a vertical UI Mode under the Window menu. 2. Fixed an path issue when building a city with street lights. 1. Updated the Scatter. Scatter now supports paint scatter, selection scatter, and Object scatter.